Actually, their encounter was coincidental. The fortuitous conversation between a stockbroker and a young mathematician in the early 1950’s proved to be seminal. After the stockbroker learned about the mathematician’s expertise, linear programming and utility maximization, and its real-life applications, he suggested to apply the math to financial portfolios. Fast-forwarding four decades, in 1990 Harry Markowitz shared the Nobel Prize in Economics for his pioneering work on Modern Portfolio Theory (MPT). Matrix rain animation courtesy TheCodePlayer. AniGif created with Gif Brewery. The mathematical framework of MPT combines asset’s expected returns, volatilities, and cross-correlations for assembling well-balanced and diversified portfolios while maximizing the expected return for a given level of risk. Its key proposition: for a multi asset portfolio returns can be maximized for a given level of risk. Likewise, risk can be minimized for a desired level of return. With the efficient frontier as its famous graphical depiction (see graph below), Markowitz’ MPT is also known as “mean-variance analysis” since the “mean” or expected return is maximized given a certain level of risk, defined as the portfolio variance (which is volatility squared). MPT proposes a mathematical framework how investors can reduce overall risk while maximizing return by holding a diversified portfolio of non-correlated asset classes. Instead of looking at the risk-return characteristics of each single asset class, MPT assesses risk and return as cumulative factors for the portfolio as a whole. The Markowitz Efficient Frontier is the graphical depiction of the collection of portfolios that offer the lowest risk for a given level of return. In an excellent video Arif Irfanullah explains in merely 3 minutes how the efficient frontier represents the set of portfolios that will give the highest return at each level of risk or the lowest risk for each level of return (highly recommended). To illustrate key elements of MPT, let’s bring to bear the top selection from a diversified investment universe SPY, EWJ, VGK, EEM, and DBC (both the full universe population as well as the selection methodology are explained in the next section). The portfolio concept under consideration for this contribution is the long only minimum variance portfolio without leverage, located at the magenta dot on the outer left side of the purple portfolio cloud (see statistics in bold font in the table below the following graph). 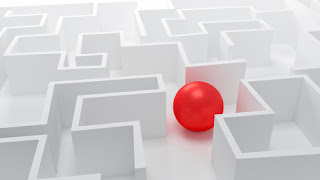 For this special case portfolio risk is minimized for all feasible long only combinations. To localize this particular portfolio an Adaptive Asset Allocation (AAA) approach is applied. 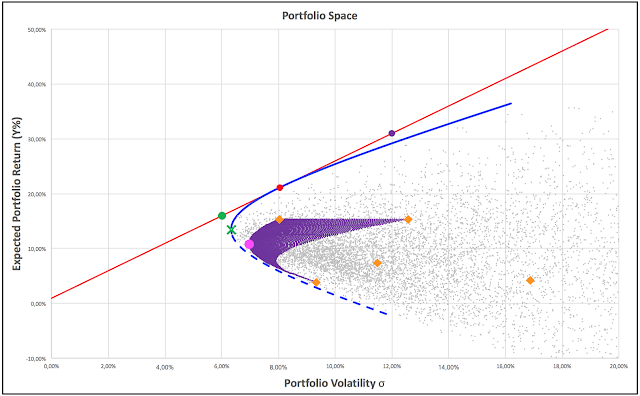 Please note the purple long only portfolio cloud is only a subset of the full unconstrained long/short portfolio space demarcated by the blue portfolio envelop hyperbola. Speed readers may jump to the next section, others please bear with me while painting the full picture. 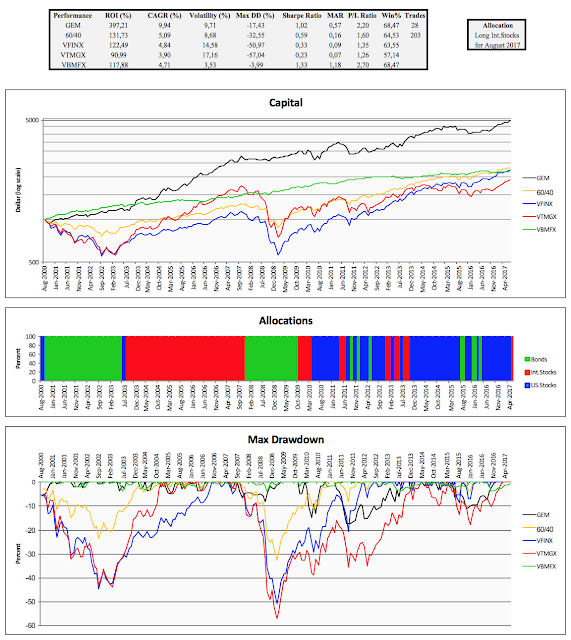 By popular demand a new beta update is available for the Global Equities Momentum Excel VBA spreadsheet. The new edition sources data from Tiingo's. Following the same work flow as before, the spreadsheet allows to backtest Gary Antonacci's popular GEM strategy (see post). NB! Backtested results do not reflect actual trading. Furthermore, trading costs, slippage, and taxes are disregarded. Results are therefore purely hypothetical. Terms and conditions apply. Next to some bug fixes a new pie chart and an annual returns table have been added to the spreadsheet. The pie chart shows the average allocations over the test periode. And the annual returns table specifies GEM's annual returns along with those of the underlying components and the classical 60/40 benchmark. As the new kid on the block, Tiingo is shaking up the data community. Tiingo offers Freemium access to high quality data for an extensive collection covering the full historical record. Starting today historical dividend adjusted data for the Strategy Signals page is sourced from Tiingo's, with delayed current day's NYSE data grabbed "real time" from Google Finance. 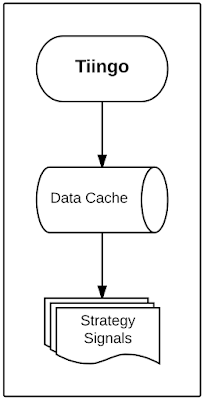 For improved performance a newly designed dedicated backend caches updates from Tiingo's data servers, and operates as on-demand feed for the various Strategy Signal tables. Tiingo's Freemium service consists of two tailored plans: a free basic service and a power service for $10/m. For details see Tiingo's Pricing page. Breadth momentum extends traditional absolute momentum approaches for crash protection. Breadth momentum quantifies risk at the universe level by the number of assets with non-positive momentum relative to a breadth protection threshold. Vigilant Asset Allocation matches breadth momentum with a responsive momentum filter for targeting offensive annual returns with defensive crash protection. Vigilant Asset Allocation (VAA) is a dual-momentum based investment strategy with a vigorous crash protection and a fast momentum filter. Dual momentum combines absolute (trend following) and relative (cross-sectional) momentum. Contrary to the traditional dual momentum approaches with crash protection through trend following on the asset level, in VAA risk is quantified at the universe level. For superior protection the VAA cash fraction equals the number of assets with non-positive momentum relative to a breadth protection threshold. The combination of breadth momentum with a responsive filter for measuring dual momentum results in a granular crash indicator that allows for targeting offensive annual returns while offering defensive tail risk protection. The VAA methodology is comprehensively explained in our paper published on SSRN. This results in monthly return weights for p0/p1, p1/p2, …, p11/p12 of 19, 7, 7, 3, 3, 3, 1, 1, 1, 1, 1, 1, respectively. 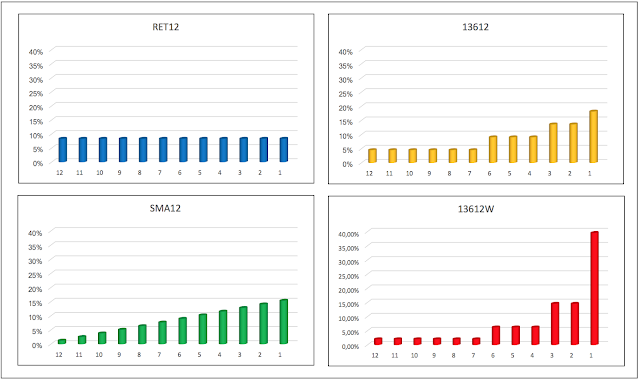 Notice that our responsive 13612W filter gives a weight of 40% (19/48) to the return over the most recent month as compared to 8% (RET12), 15% (SMA12), and 18% (13612). The following graphic crystallizes the various weighting schemes for the mentioned momentum filters. 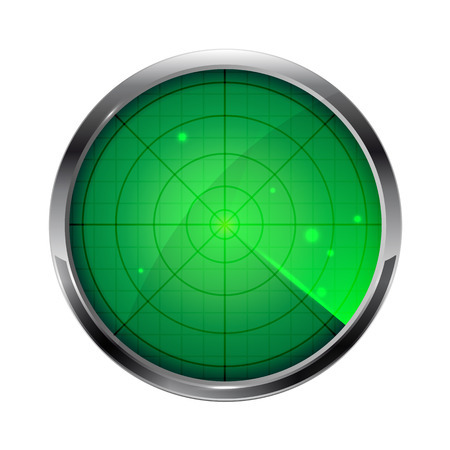 Within the VAA frame work our 13612W filter is applied for both relative and absolute momentum. In order to present results as realistic as possible in our PAA-paper, we constructed long-term end-of-month data series for popular ETF proxies, like SPY, GLD and TLT (see paper appendix on SSRN). All data series start December 1969. 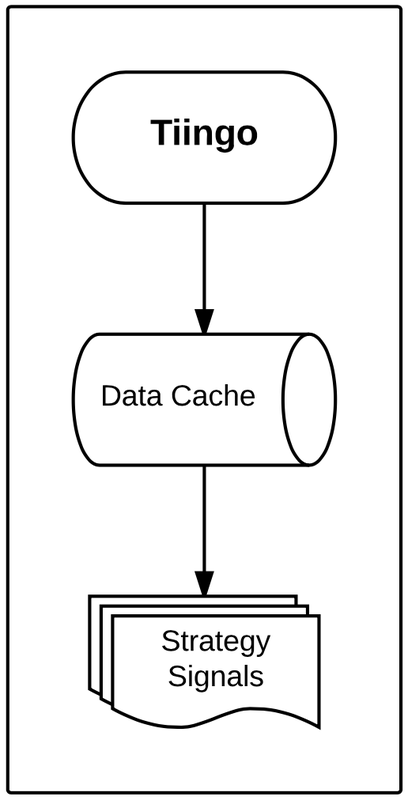 For the pre-inception history, the proxies are derived from suitable indices. As part of a complete revision of the long-term data set, we recently improved the construction of the data series by mapping the underlying index through a linear formula to arrive at the best fit over the life span of the ETF to be replicated. The construction process is demonstrated below for EFA. The link to an example spreadsheet with all the necessary calculations is published at the end of this post. 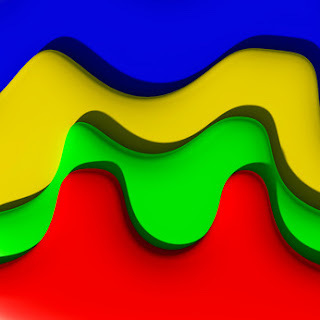 EFA seeks to track the investment results of the MSCI EAFE index which is composed of large- and mid-capitalization developed market equities, excluding the U.S. and Canada. The index data is available as free download from the MSCI website. Comparing EFA’s historical data record against the various index levels supported by MSCI like Price, Gross, Net, reveals the MSCI EAFE Net index as underlying index. 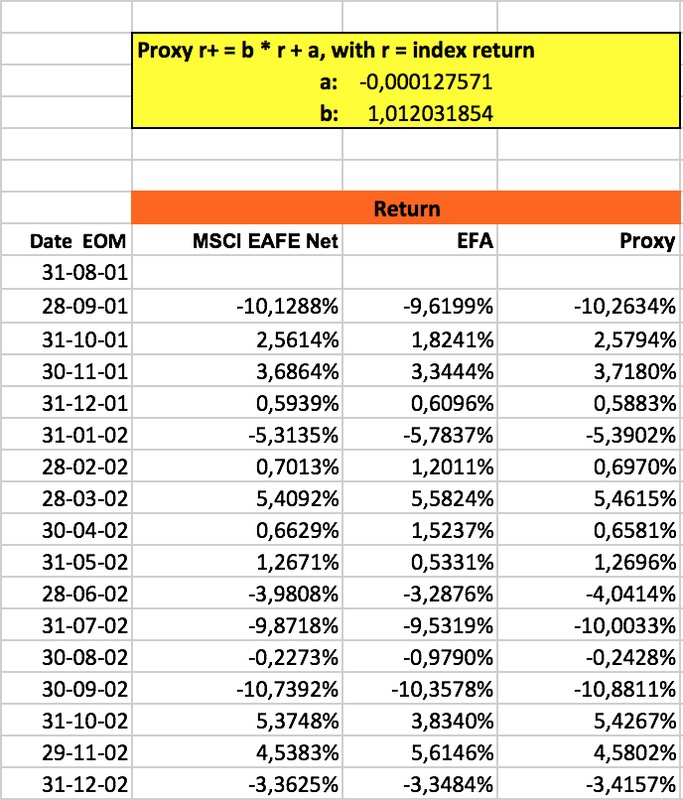 Historical dividend adjusted data for EFA itself is offered by Yahoo Finance, also for free. For constructing a long-term EFA proxy the data from both sources is required. 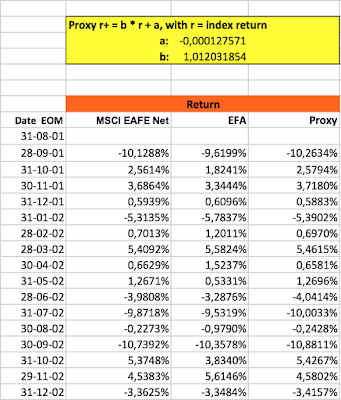 With the data readily available in Excel, the next step is to derive the data for the ETF-proxy from the underlying index for the In-Sample (IS) period. The goal is to map the underlying to arrive at the best fit over the life span (=IS) of the ETF through a linear formula: r+ = b * r + a, where “r” is the return of the index and “r+” is the return for the proxy. The values for the coefficients “a” and “b” are determined through Excel’s Solver add-in by minimizing the unexplained sum of squared deviations for the return series of EFA and the ETF-proxy. After Solver finishes the calculation cycles, the found coefficients result in high R-Squared and correlation readings.